Pat O’Toole has always idolized his older brother, Coop. He’s even helped Coop with some of his crazier plans — such as risking his life to help his big brother dig a tunnel underneath their neighborhood in the suburbs of Washington, DC. Coop is . . . different. He doesn’t talk on the phone, doesn’t use email, and doesn’t have friends. He’s never really cared for anything but the thrill of being underground and Pat. So it’s no surprise to anyone — even Pat — that after a huge fight with their parents, Coop runs away. Exactly one year later, Pat receives a package containing a digital voice recorder and a cryptic message from his brother. He follows the clues to New York City, and soon discovers that Coop has joined the Community, a self-sufficient society living beneath the streets. Now it’s up to Pat to find his brother — and bring him home. I just finished Beneath. I enjoyed it and will now be waiting for the sequel…right? When is the next book coming out???? This one left a person hanging and I can hardly wait for the next one. There will be a next one won’t there? This book was great will Beneath turn into a series? I’m a big fan of your newest book and live in Portland Oregon too. you are very inspiring to me and have lots of your books. My goal is that by the end of this year I would have read all of your books. 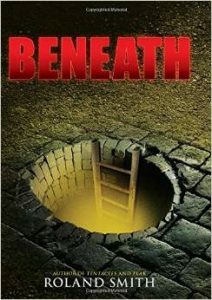 Can’t find any non-copyrighted pictures of the “Beneath” book cover to display in my library…any objections to just grabbing one from google? I love Beneath! I am anxiously awaiting the next book! Any idea when the next book will be out? Students are asking if there is a sequel to this great book. It was very good. My son just finished Beneath and really wants you to write a sequel. Please let us know when it is finished! A friend of mine bought your book at the book fair for the school both our kids go to. She lent it to me, said she had to read it, she blasted through it in no time. I’m very VERY picky about my books, they have three pages to get my attention. . . You had me on the first page. I just started reading it at 9pm tonight. It is currently 12:17am, I COULDN”T PUT IT DOWN! Love this. We would both love for there to be a sequel to this. Thank you for sharing your gift with the world and allowing us another escape from reality. Beneath. Please make a sequel to this! My teachers name is Mrs. Carter and she has helped me get into the series of Beneath. You had came to my school and boy was I excited. P.S Thanks for signing my book! My name is Andrew and I am in the 4th grade. I read Beneath this summer and I thought it was amazing. This is the first book I’ve read of yours and now I want to read more of your books! Will there be a sequel??? If there is I would buy it! To read Roland’s books online would require that you first purchase them at one of the online retailers listed in the blog. Happy reading. I really don’t like reading, When i do read a book it takes me 3 months to finish it and that’s if i finish it. But with beneath i fini9shedn in in three weeks and i really hope there is going to be a sequel. please make a sequel. Is there a sequel can’t wait to read it. Left me at a clef hanger. We don’t even know what’s happen to Alex or Kate and the brothers! Loved Beneath! Lod should be Lord of murdering parents not Lord of the deep! Hate lod love Kate, Pat and Cooper! Your an amazing book writer Roland! I will DIE if there’s not a sequel! I’m praying for a sequel!!! I hope Kate and Coop fall in love!!! This book was AMAZING! Our hearts were racing the entire book. Mia, 12, read it based off of Andrew’s, 10, recommendation. Exhilarating for everyone. WHEN WILL THERE BE A SEQUEL????? I recently read your new book Beneath and I loved it! I could not put it down. I love how you let your character tell the story in first person. I work in a middle school library in Lincoln NE and have recommended this book to lots of students. They also told me how much they enjoyed reading it. I especially recommend it to our reluctant readers and I have not had a disappointed student yet. I also wanted to let you know that our 7th grade English classes do a unit on Mount Everest and they read your book “Peak”. Another big hit. Thanks for writing such great young adult books! I absolutely loved this book!!!! There HAS to be a sequel!!!! Beneath is an awesome story! You must have a series of the book becaues Lod escaped…..& there should be a capture of him! We have a 6th grade class reading this as a group and they LOVE this book!!! this book is so good i have been reading a different one called peak and it is so good i love the begining and cant wait to get more into it. Hi my nine year old son Jake wanted to say – He liked it, and thought it was awesome! He hopes there is a sequel! this book was amazing! I need to read the second one! wait, as I’m reading the other comments I cant tell if there is a second. THERE HAS TO BE A SECOND ONE RIGHT?!?!?!?!?! I just finished reading your book beneath and I loved it. But there are so many things that I still wanna know after reading this one. Will there be a second one? Ok so I hate books, but I read books for school as an assignment. I have to do it for a grade. But I rarely pick up books to just read. This book is probably the second book I picked up to read for fun. And when I got to the middle, I was like “Man I gotta read this”. This is by far my most favored book ever written. And when I finished 4 days later all the way to 11:24 pm, I picked up the phone, looked on the web to see if there is a sequel. And there isn’t. May you please make another one? It’s literally a cliff hanger at the end and I need a finisher for it!!! I purchased your book for my middle school ELA classroom library. I tore through this book and loved every minute! My students are going to love reading this adventure. There is going to be a sequel, right? I mean…please let there me a sequel!! ABOVE will be out in September.